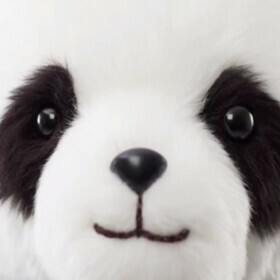 Google Japan today unveiled what is likely the cutest personal assistant ever: Google Panda. As you'll see for yourself, Google Panda is not just cute, but also extremely smart. Using the power of Google Now, the lovely assistant can answer to your questions in 0.3 seconds. Ask it anything, and it will reply almost instantly. The fuzzy Panda recognizes 50 languages, so it's not made just for Japan. Unlike most smartphones, Google Panda is shockproof: its fluffy fur makes sure that what's inside remains safe in case of impact. Moreover, you can attach Panda to your arm when going out - either for a walk, or to jog - and it will never let you go (unless you want it to). The new personal assistant comes in two sizes (Google Panda 5, and Google Panda 6), and is made even for "people who don't normally use devices." You can watch the announcement of Google Panda in the video below (in English and Japanese, subtitled when needed). P.S. : It's already April Fools' Day in Japan! How much will this even retail for? I hope that Microsoft has their own version to compete. Seems like a creative new category of products that many consumers will find useful, but it will be strange at first for earlier adopters. ( ͡° ͜ʖ ͡°) I see what you did there!!! This is a promising new product category. I will always love Microsoft but this is real innovation that people should applaud. Does this mean Apple is going to copy them with an Apple iSheep assistant? Great, now my daughter wants one. in japan it is !!! Shut up and take my money! I want this Ahhhhhh!!! Not funny, I actually want this! Wow! I actually want one. In other news, you can play Pac-Man on Google Maps. Go anywhere your heart desires and click on the bottom left corner of the screen and BAM! Pac-Man.